I am secretly a rock star. The "regulars" know this, the "newbies" may not. Both of my parents have music degrees. I have been able to sing as long as I can remember, and learned to harmonize very early as well. I started playing piano by ear fairly young as well, but my passion is singing. About ten years ago I met someone that has always encouraged my abilities. He has been like a mentor to me since. The evolution began with him asking me to sing solos - covers of songs that I didn't think I had the guts to do but this is someone you don't say no to. Around the same time I joined a band - I was the only girl and wanted to be included. I began as backup singer and tambourine player and then drew on my beginnings with the piano and became a keyboard player. Three years ago I started singing with two different groups. The first was Ella Mental, an acoustic trio. TJ and Megan played acoustic guitar and I sang and played percussion. The other group was The Swing Sisters. Chelsea and I had been talking about our love of swing and big band jazz era music and wanted to start a group. We met Brooke thanks to an organization called the Dickens Carolers, which Chelsea and TJ both sang in. We asked Brooke if she would be interested in a Swing group and she was excited about the idea. 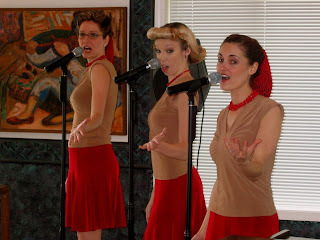 We began rehearsals in January of 2005 and our first performance was a private party on Mother's Day that year. We had ten songs memorized and choreographed, and were a big hit. Our repertoire soon grew to about 15 songs by June, and we began performing monthly at a local jazz diner that had just opened. The demand grew quickly and by August we began performing twice a month on Thursday nights around 10pm. By September we knew about 30 songs and were constantly improving our "moves" and learning new tunes. In December we performed as the entertainment for my company Christmas party. 2006 found us in even more demand and we were moved to Friday nights at the diner, with an earlier call time. This brought us an even wider following and we performed by request for a couple of Saturday night parties at the diner to a packed house. I met Scott in April of 2006 and moved to Key West in September, 2006. In between I continued to perform with The Swing Sisters (and Ella Mental, now performing once a month at a coffee shop) and we pursued lessons in improving our choreography and stage presence. I have tried to take an attitude of "out of sight, out of mind" but I am grieving for my group. I was replaced, which I expected, and they are going strong, performing in several venues around town. I wish I could say that I would love to see them perform when I go home to visit, but I just can't bring myself to do it. I am jealous. I am still a little bitter. 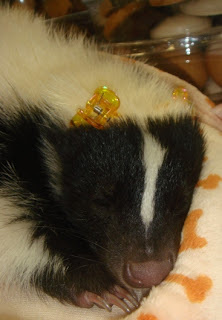 Since we've been talking skunk lately - I'll fill everyone in on what it's like to HAVE a pet skunk. This is her cage. It fits nicely between our entertainment center and the wall. It looks pretty different now - this picture was from the first day she was home. The bed is now on the main floor, the inner ladder is removed and the hammock is gone. She wasn't getting the hang of the inner ladder and just sleeping on the floor - so I decided to just keep it one level for now. Her litter pan is triangular and goes in the back left corner. She has a big ceramic water bowl in the front left corner and her blue bed is on the right side, underneath a big green plastic igloo she likes to hide in. Skunks are nocturnal, so she's been sleeping during the day for the most part. I'm trying to get her to interact with me in hopes we can switch her schedule around, but I haven't tried too hard yet. 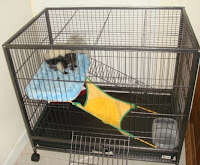 Stinkerbell is only in her cage when we are going to be gone for more than a half hour or at night when we go to bed. That will probably change with time, but for now I want her to be able to really establish it as her space - her safety zone. Feeding happens in the morning - anytime between 8am and 10:30am - and evening around 8pm. She's been pretty good about being patient, she likes to wait at my feet while I'm making her meal and then follows me back to her cage - she knows that's where she eats. The Diet is a mixture of skunk food pellets (made by Exotic Nutrition), cottage cheese, and thawed or fresh veggies and a little bit of fruit. Initially the veggie portion was some mixed veggies (peas, green beans, carrots and lima beans) but she doesn't like the lima beans. I try to give her some variety at breakfast, lately a couple slices of yellow squash and green beans or peas and then the mixed veggies until they run out at night. For snacks she gets a baby carrot or a couple of seedless grapes, we also have some dog treats that are made from dried lamb lung (sounds disgusting to me) that Stinkerbell and Buster both love. The main hurdle is keeping her out of the dog dish. Buster is catching on that he has to eat while he has the chance because then the dish gets put up out of reach. We do a lot of snuggling on the couch - she likes to lay right above our heads if she's not in our laps. She's been showing interest in toes - playfully nipping at them. We have to discourage this though, because even if it is meant as play, the teeth are pretty sharp and her bite will only get stronger as she gets older. I have to schedule an appointment for her to be spayed soon, apparently skunks can develop nasty attitudes when they hit "puberty" (sound familiar to any moms of teens?). I commented to Scott last night that Stinkerbell is easily the cleanest pet we own. She poops consistently in her litter pan, and cleaning it is far easier than cleaning the cat box or picking up dog poop outside. She is also the quietest pet. She doesn't whine like a dog or meow like a cat. Very peaceful in general. I received my Class III Wildlife License in the mail today! 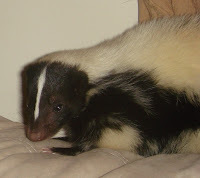 I am officially the proud mama of a pet skunk! I love hosting visitors at our home. Living in Key West and having an extra bedroom with it's own full bath makes it a prime opportunity for friends and relatives to come visit at a reasonable price. Even before I moved and before I bought my Vancouver house, I used to host a "Dinner Night" every Wednesday night for 10-20 people. I would plan the menu and do most of the cooking, instructing guests what to bring as contributions to the meal. It's probably the Old German Lady living inside me - I feel the need to feed everyone or cover them with a blanket. I've never claimed to be a clean housekeeper despite having frequent guests. All my life the only thing that has motivated me to clean my room (then house) was the impending arrival of a friend. My mom was quite exasperated at my version of cleaning my room (throwing all the crap in the closet or under the bed) and even when I went away to boarding high-school, having someone come stay with me was my only motivator to straighten things up. Living in the opposing corner of the country from the majority of my friends and relations has given me ample time to let my housekeeping skills go totally in the toilet. 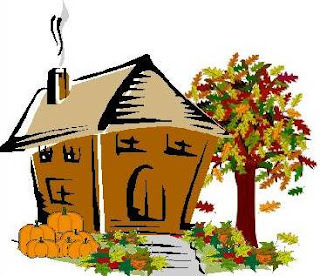 Fortunately, beginning in February this year we've had guests from out-of-town nearly every month. Tonight two of my cousins arrive and we spent the afternoon and evening cleaning up our house. I have to say it looks pretty good - especially since I bought a couch cover, new throw pillows and put up sconces that have been waiting patiently in the corner for months. I'm glad I can be forced to sterilize the pigsty once in awhile, or Scott would probably leave me. I was shopping today at a Winn Dixie. For those in the Northwest, Winn Dixie is pretty similar to Winco. It is very likely that a section of the store is under construction at any given time, and guaranteed that someone is shopping in their pajamas regardless of the time of day. Today as I was exiting the store, a woman stepped on the scale in the cart holding area. She said "I lost 10 pounds!" I said "Nice!" before actually looking at her and then realized that she was pregnant. She said back to me "NOT nice! That's bad! I'm this pregnant and lost weight!" I nearly bit through my tongue to keep myself from pointing out the fact that the cigarette in her fingers was probably not a good way to pack on the pounds. I also wanted to punch her in the face. I called my maternal grandmother yesterday to thank her for the very thoughtful birthday card she sent me. It may be the first time I've called her in the year since I moved to Florida. When she answered I was surprised that she sounds old now. Growing up I spent a lot of time with my mom's parents. My mom was an executive and traveled around the country a lot. Most of these trips meant that I stayed with my Grandma and Grandpa during her absence. When I was very young, I would spend the morning with a babysitter and then join my grandparents in the afternoon at the two-room school where Grandma taught 1st through 4th grade and Grandpa taught 5th through 8th. As I got older I stayed at the school with them all day, hanging out in the loft and reading or drawing. At home with them, Grandma taught me to bake, crochet and sew. On trips to Walla Walla, Grandpa taught me to count and about the constellations. I recall many trips before the seatbelt laws came into effect where I laid in the back window of their Volkswagon Rabbit and gazed at the stars during the four-hour trip. We would take this same trip about once a month and then more frequently as my great-grandparents health failed. Driving through the Columbia Gorge holds countless memories for me and it is still a pleasant experience. I learned to read early, thanks to my mom reading to me every night before bed and my grandparents doing the same when I stayed with them. My favorite book to have Grandpa read to me was "Nose Is Not Toes." Even now one of the first things he says to me is "Marisa, nose is not toes!" and giggles. I learned to ride a bike thanks to my grandparents. They purchased a black and yellow boy's bike with training wheels at a garage sale and we began the process. I was horrified at first to have to ride a BOYS bike, but I got over it quickly. In later years I would have a bike at their house and the three of us would ride together. I was so proud that my Grandparents rode bikes at their age (I think they were probably in their late fifties or early sixties at the time). I vividly recall the pattern of the linoleum on their kitchen floor. I remember the summer that they tore out the tree that had the three swings hanging from it's biggest bough and replaced it with a koi pond. The pond was finished just in time for my birthday party, and I was invited to swim in the pond with my friends before the fish were put in. I remember that my grandfather was an honorary member of the engineers club at Shady Dell, and they took us to ride the miniature trains often. I was in still in elementary school when I grew taller than my grandparents. When I was in high school they moved from the house I had spent so much time in to one near some of my Grandma's siblings. Now our trips to Walla Walla were to see my grandparents, instead of with them. About 5 years ago my Grandma was diagnosed with cancer in her abdomen. Right about the same time one of my very close friends who was only 25 was also diagnosed with abdominal cancer, but she was pregnant. My friend underwent mild chemotherapy and initially seemed to be responding well to the treatment. Because of this, I strongly encouraged Grandma to also have chemo. Sadly I lost my friend after 3 months of her battle, but Grandma went into remission. In the four years since she has 3 relapses and 3 more rounds of chemo. I am suddenly faced with my grandparents' mortality. I am not ready. They contributed so much to my childhood memories and education, and I want them to meet my children and have my children have the opportunity to learn from them. When they go I will not be ready, even if they are. I owe them an immeasurable amount of gratitude and can only hope that I have begun to express that to them in the time I have left. As I sit on the couch, slogging through the Access database I'm using to create my guest list for the wedding, I realize it is Friday night. Not that any of you have run breathless to your computer to see what brilliant brain stumping lyrics I'm going to quote today, but here they are regardless. I've decided to look for a new abode for our family. Our rent went up with our new lease and Scott wants to quit his second job so we can actually see each other. Our friend-that-was-supposed-to-move-away-and-isn't has a house that runs him $1500 a month for two bedrooms, one bath. The kitchen is small but it has a very open floor plan that I like, and a fenced back yard that is enormous. We looked at a house last night that's $1900 a month (we're now paying $2140) and it's cute, 3 bedrooms, one bath, but in a really junky neighborhood. We're probably going to have to drive around the neighborhoods we like and hope for a "for rent" sign. In the meantime, I need to get at least one renter in my house in Vancouver, preferably two. I'm going to revamp my old Craigslist ad and see what happens. I would rather have renters that I know, or that my current occupants know, but I guess I'll have to just see what I get and be choosy. For those following the skunk saga, It's looking good! I'm in process of getting the Class III Wildlife license and last night a brilliant name came to me... Stinkerbell! HA HA HA HA HA!!! I'd probably just call her "Belle" for short. She's been pooping faithfully in the corner litter box I put in her cage, so that's one hurdle we were concerned about! Our realtor (landlord's rep) came into the store a few days ago and I broached the subject of my skunk with him. He said "if you decide to keep it, I don't want to know about it." Not that I'm expecting any other landlord to be ok with a skunk, but it's worth a shot. When I was about 3, I discovered the ability to jump off of things. You know how excited kids get when they find out they can leap from something on to the floor - it's very liberating. We had just arrived home from the hospital (I don't know why we were there) and I wanted to show off my new skill to my mom. When the side door of the van was opened I attempted a jump from the van to the sidewalk. Back to the hospital we went and that was my first set of stitches, right in the top of my head. In fourth grade I wanted to be cool like the other girls and do a "cherry drop" from the monkey bars. The idea is to start hanging from the bar by your knees, and by swinging back and forth, gaining enough momentum to flip and land on your feet. I landed on my back with my left arm underneath me. I wore a brace and ace bandage for a month for a "green-stick" fracture. Sadly, I didn't grow out of this problem, it only got worse as time went on. The summer after my freshman year in high-school, I was staying with my aunt and uncle for the summer. My aunt and I decided to ride our mountain bikes in to town to get the mail, and on the way back our final navigation was to cross a main road and then turn onto the street their house was on. All I remember was waking up face-down in the gravel with my bike on top of me. I was rushed to the emergency room in the cab of a truck that had stopped at the "scene", and I withstood the nurses scrubbing the gravel out of my face with a sponge. The on-call plastic surgeon sewed up my lip and I visited a dentist and ear, nose and throat doctor to make sure I hadn't screwed things up too much. It took a couple of months to heal, just in time for school. During my sophomore year I managed to crash skiing and plant the end of my ski-pole into my face, and then a few months later bounce my face off the sidewalk while rollerskating. My skull endured several other injuries during my high-school career, from having a friend lift me up to change a lightbulb and running my head into a nail to falling down the stairs carrying a laundry basket and landing with my cheek on a corner of the laundry bin. I'm amazed I made it to adulthood in one piece, not looking like a plastic surgeon mistake, and un-brain-damaged. As I enter my 4th decade, I decided to revamp my blog a bit. I've added links to other blogs that I enjoy regularly in addition to links to sites where I spend a lot of time. My birthday was a fun day - I started the day itself with a trip to the vet for the dog and all three cats. Our vet of choice is over an hour away, and Buster was very good in the car with the three cats wandering around at will. Chou and Buster had rabies boosters, Minx was diagnosed some antibiotics for a skin issue, and everyone was weighed and groped. Buster needs to lose about 7 pounds, and we need to start brushing Chou's teeth. Everyone else is in good shape. I have always been able to trim the toenails on the boy cats, but Minx becomes a kitty-demon as soon as I try to hold her down at all. It took the vet, the tech and myself with a towel to wrestle each paw into position. After arriving back home I took a nap, and Scott stopped at home between jobs long enough to give me my present, a video ipod! YAY! I had many birthday cards and calls, and Scott and I began the skunk negotiations last night as well. 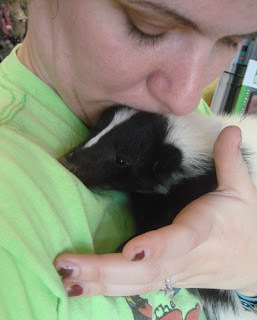 I began the process of applying for a Class III Wildlife license today, since it is required to own a skunk and even if we don't keep her, it will look good on my resume as I am store manager. And they just carry me away..."
It's neck and neck and neck. That's a lot of necking, people. Let's concentrate on the music, shall we? Last night the bosses took Scott and I to dinner at a very nice restaurant in Key West - pics to come. BEFORE we left our house (they picked us up) they gave me my present. I opened the very large gift bag to see a cardboard box. I opened the box and there was THE SKUNK!!! My boss GAVE me a birthday SKUNK!! I'm thrilled and yet not jumping up and down yet because my boss didn't actually TALK to Scott about it first, so there's still some negotiating to be done. In any case, Squirt has to live at the store until I get my Class III Wildlife license which would allow me to have her.